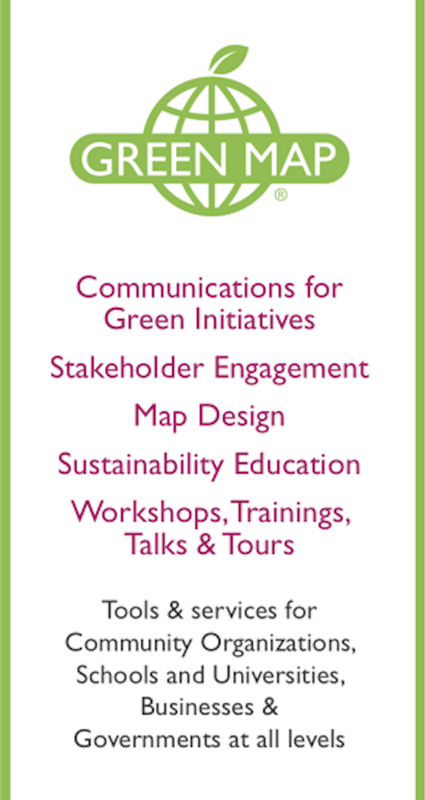 Green Map System has been a consultant to several different kinds of projects, supporting community engagement, sustainability communications, project management, and of course, mapping. Our team and network has worked with local nonprofits, companies, universities and governments as consultants or in collaborations that amplify opportunities and outcomes. We’re eager to do all we can to address today’s conditions and tomorrow’s challenges. Green Map's consulting fees are set on a case-by-case basis. Services including consulting on project strategy, development, implementation, map design, communications and marketing; speaking fees; workshops and related engagements. All sectors: While there is no longer a pre-set Mapmaker fee, our Creative Commons 4.0 license includes a +CC which indicates reciprocity from income generating projects. Contact us about your objectives at any time. With a Company? Download our CSR backgrounder on projects that improve workplace sustainability and social responsibility. Government agencies, we invite you to download this backgrounder on our services for you, too.